I hope you are all having a great weekend. It feels like the half of it is over without having done all that much. There is hope though, next week is a three day week, so there is something to look forward to. Highlights of today include playing with Suqqu Summer Trios and visiting our favorite Japanese restaurant for dinner. And tomorrow is the big cleaning day! Recently I am into minimal bases combined with a good spot on concealing. That way I feel that my skin can show through more and the resulting finish looks more natural. I started searching for tinted moisturizers which offer just enough coverage with which I can live with. Having dry skin, it is also important for me that the base product is not drying and that it doesn't emphasize my dry patches. I have been testing bareMinerals Complexion Rescue for over a month now and here are my thoughts about it. bareMinerals Complexion Rescue comes in a plastic tube which feels thick enough so that it doesn't get deformed in your bag. It is a squeeze tube, which I prefer to a pump since with pump it is sometimes not easy to get all the product out. The name implies that Complexion Rescue is a Gel Cream. To me the consistency is more like a cream than gel. It acts like a "gel" in that sense when you start distributing the product on your face, it feels more slippery, which I really like. It claims not to have any silicons or oil in the formula so I find it impressive how easy it is to apply. It is also claimed that regular use of Complexion Rescue Tinted Hydrating Gel Cream moisturizes the skin and protects it with anti-oxidants such as globularia cordifolia extract. It also has minerals such as calcium and magnesium in the mix and gel cream comes with SPF 30. The first time I used bareMinerals Complexion Rescue I was a little unsure if it gives me the right amount of coverage. I want a minimal base but I also would like benefits such as evening out the skin tone and making a few of my spots less apparent. There was unfortunately a small misunderstanding with the communication and I got sent "01 Opal" which is the lightest shade instead of 02 Vanilla, which should have fit better. You can see below that Opal is a little cool and somehow lighter than my skin you look at my face. If you would like to match with my rather pale neck though, it may even be a match. 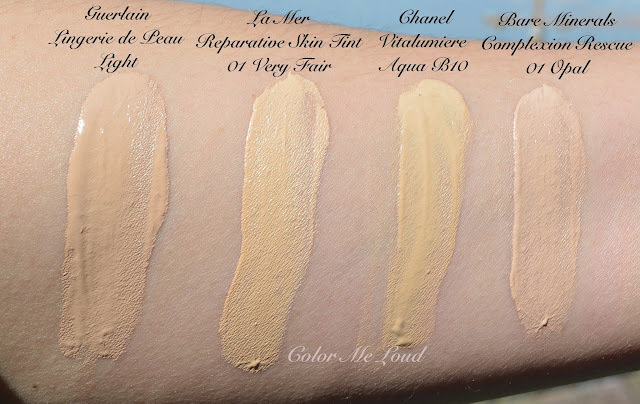 Now as for the coverage, it is less than some other sheer bases I am used to, such as Guerlain Lingerie de Peau or La Mer Reparative Skin Tint (reviewed here). The coverage is close to Estée Lauder EE Cream, which I also find to be a little too sheer for my liking. Of course if you have time to conceal each and every spot, it is great to use this base and later on work on the imperfections, it looks perfect, something like Lisa Eldridge shows here, she also mentions this product). In the mornings though, I don't have much time. I would like to get away with something + concealing two or three spots at most. You can see below although it does even out the skin tone some of the redness on my cheeks show through. Also because of SPF it reflects a bit too much for photography but this is not a concern to many of you. As for the claims, as a dry to normal skin gal, I can feel that it moisturizes my skin and leaves it smooth and nourished. As I have already mentioned, it has a nice slip on the skin without having silicons. The lasting power is moderate, not as long as La Mer Reparative Skin Tint which lasts all day on me without reapplying. 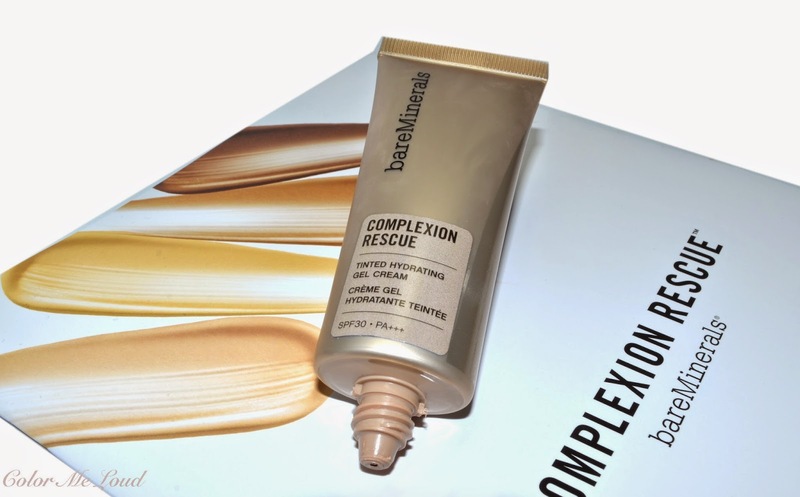 bareMinerals Complexion Rescue Tinted Hydrating Gel Cream lasts about 8 hours on me. You can see by the comparison swatches below that Guerlain Lingerie de Peau in Light, my match made in heaven at the moment, is deeper but have similar undertones. La Mer Reparative Skin Tint 01 Very Fair is warmer. Chanel Vitalumiere Aqua B10 is also warmer and a tad deeper. Final thoughts: bareMinerals Complexion Rescue Tinted Hydrating Gel Cream is really a lovely sheer base for those who don't have much skin pigmentation or discoloration. On me, it is a little sheerer than I can get along with so I need a more extensive concealing and that takes time in the morning. It works as a base to other make-up though and gives my dry skin a nice hydration. The formula is without silicons and oil, no detectable scent and with extra minerals and SPF 30. I really love the application and the feel, just wished there would be a tad more coverage. 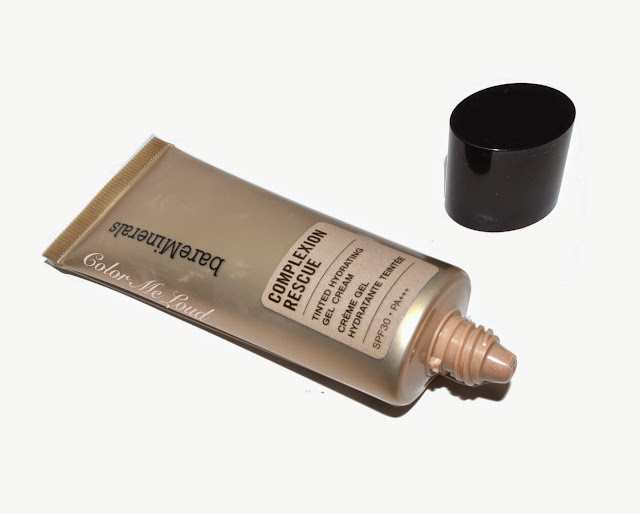 bareMinerals Complexion Rescue Tinted Hydrating Gel Cream is now available, retails for 26 EUR, which is a great price for this product. What is your favorite sheer base? Disclaimer: The product in this post was provided free of charge for consideration purposes. My favourite sheer base is face and body by mac. I looove how skin like it looks like. However, I only use it when I will be out and about only a couple hours. As I have oily skin, if I use it longer I look like an oil slick! Otherwise, the Laura Mercier tinted moisturizer is another very good option that can offer a bit more coverage. Today I started testing the new mac pro longwear nourishing something or other foundation. I got a sample at the store and I have loved it today! It is a tad more covering, looks really nice and endured my skin quite nicely! Hi Sara, I have been testing this foundation for the last few weeks too and I love it. This is the first sheerer base I am ever using, I have always thought I need a full coverage foundation. But I don't. I think it's perfect for the summer and it covers enough. I still use a dusting of finishing powder over it! And I am actually using shade Vanilla and it's a perfect match for me. I think I might need Vanilla too, or Cream, one of them is also a better match for me. Maybe you have better skin than me. I wished I had a little less discoloration and get away with this one. On a good skin day, I used it alone and it felt really good, moisturizing and light weight. I am glad you enjoy yours too. Ah now you remind me, I have to yet try Burberry bases, haven't done that yet. Laneige BB Cushion, which I absolutely love is definitely more coverage than this, also Chanel Vita, they are light coverage but not as sheer as bareMinerals Complexion Rescue. I am also all for light coverage but if it is too light, concealing takes too long for me in the morning. Never owned a MAC face and body foundation. I have heard so much about it, I need to go and check it out eventually. Too bad about the lasting power though. I apply make-up in the morning and I don't get along with things which don't last until the evening when I am back from work. The new hydrating base from Laura Mercier is also a great one, have you tried that out? 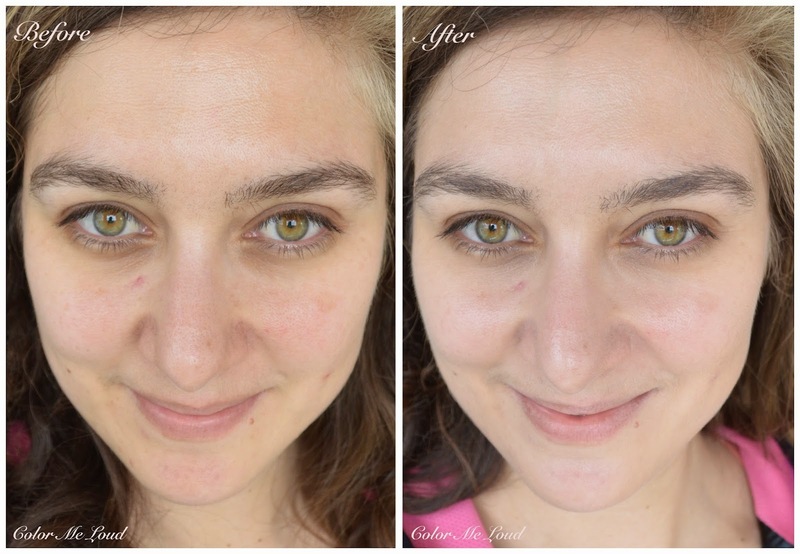 I am excited to hear your thoughts about new MAC foundation as you test it longer! I am intrigued by that one too. I have one foundation from Clinique, Ivory (I believe it is #03) matches me perfectly. I checked now, Clinique CC has only 3 shade offers in Germany. I might just go ahead and try Light one (there is light, light medium and medium). With Nars I have a sample size of Alaska (I believe this is the shade) and it looked like a nice match. We don't have Nars in Germany, so each time I travel to France, I drop by a Sephora and try to get a glimpse of the offerings. If you don't spend some hours on the counter, it is hard to get warmed up to the brand, especially since there are so many companies at the moment to which I have access to. I will try Nars and Clinique and let you know :-) Thanks for the recommendations. I have been contemplating to try this but I also would like to try the new foundation from MAC Pro Long Wear. I will let you know which goes to my shopping cart haha. Thanks for the review. I have a hunch my shade would be Ginger. My fave sheer base at the moment is PONDS BB cream. My main skin concern is discolouration, so I don't think this one is for me. The search continues! Perhaps I should try the Guerlain Lingerie De Peau instead. I usually get away with building up coverage on the places I have to and feather out towards the outer perimeters of my face with a regular foundation.. but a couple of new bases doesn't hurt, right? ;) Have you heard of the new MAC Pro Longwear foundation btw? It sounds interesting! It looks great on you Sara. It's very natural, like skin :-) On another note, I'm currently trying to use up as many base products as I can, so I'll be adding interesting stuff to my wish list. When I'm ready to buy, I'll get the one I'm most interested in. Sounds like a good plan right? I am very curious about MAC Pro Long Wear too. Let me know if you try one or the other. Pro Long Wear should be more coverage though right? I have never heard of PONDS BB, gotta check that out! Do you have dry skin as well? If you are dry to normal, I can recommend Guerlain Lingerie de Peau. I have heard about the new MAC Foundation, I have to go and check it out, very exciting stuff! yes it is a bit too natural maybe lol. It sounds like a good plan. I will be watching you as an inspiration. I also use somethings and then replace them. Everything else lays around unloved. Oh, I'd love to know what you think! I am into BB and CC creams, I prefer them to foundation actually, and I recently sought a change from Hydralife, which I'd been using forever! So I did some extensive research (and shopping..!) and the Nars tinted moisturiser worked the best on my skin. It's not the most hydrating when you apply - you will not feel that coolness on your face as you do with Clinique or Laura Mercier. But long term, it smooths my skin and calms my acne, where I have it. It's a love for me, I just wish it stayed on longer in my oily areas without having to touch up! Light and Medium light aren't that different and you are fairer than me, so you might very well be better off with Light. I am 020 in Dior but 030 can work ok too, so I think you are probably right :)! I have pretty good skin, so this might work on the weekends, when I want lighter makeup. But I prefer my foundations/bb creams to be medium coverage, then I just sheer it down with a cream, liquid highlighter, or beauty blender. (for a BB) on me! Thank you for the review - I wanted to try this, but after seeing how sheer the coverage is I can say it's a pass for me. More $$ for other things ha ha! It looks lovely on you. I personally think it's enough coverage for you!